연산호란 부드러운 겉표면과 유연한 줄기구조를 갖춘 산호를 통틀어 말한다. 제주 남부 연안의 연산호 군락을 구성하는 산호충류는 무척추 동물로 ＂바다의 꽃＂이라 불린다. 특히, 연산호류는 육상의 맨드라미를 닮았으며 부드러운 동물체로 수축 ·이완상태에 따라 크기에 변화가 심하다. 연산호 군락지에는 돌산호류, 각산호류, 해양류 등의 다양한 산호류가 다양한 형상으로 어울려 서식하고 있다. 송악산 해역중 대정읍 쪽으로는 3미터 깊이에서부터 수심 18미터까지 직벽을 이루고 있는데 그 곳에 연산호 군락지가 형성되어 있어, 향후 관광잠수함이 운항될 가능성이 많은 곳이다. 송악산 쪽으로는 연산호류가 꽃동네를 이루고 있다. 서귀포 해역은 5도인 범섬, 문섬, 새섬, 숲섬, 지귀도가 자연방파제가 되어 그 사이에 연산호류와 함께 다양한 산호충류가 암반 위에 화려한 군락을 이루고 있다. 제주연안 해역에는 한국산 산호충류 132종 중 92종이 서식하고 있으며, 이 중 66종은 제주 해역에만 서식하는 특산종으로 수심 10∼30미터의 암반에 군락을 이루고 있다. 특히, 송악산 및 서귀포 해역은 세계적으로도 희귀한 연산호 군락의 자연 상태를 전형적으로 잘 보여주는 특징적인 곳으로 분포상 학술적인 가치가 매우 높다. 현재 서귀포 해역(서귀포시) 70,410,688㎡, 송악산 해역(남제주군) 22,229,461㎡ 가 지정되어 있다. 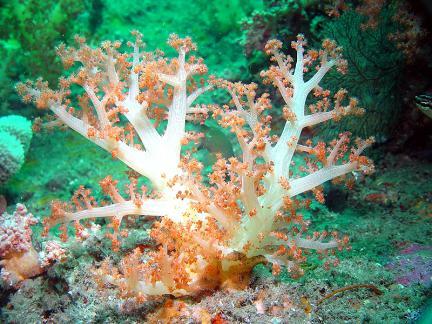 Soft coral refers to those corals with soft surfaces and flexible stems. 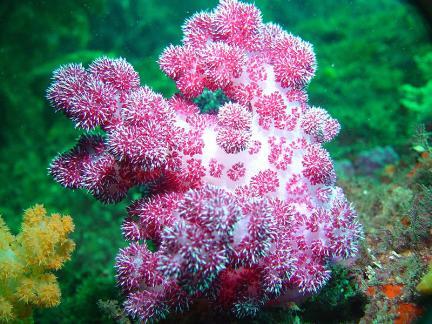 The corals along the coast of Jeju consist of anthozoa invertebrates called “flowers of the sea.” Soft corals particularly resemble cockscomb flowers, and their size varies according to whether they are inflated or deflated. 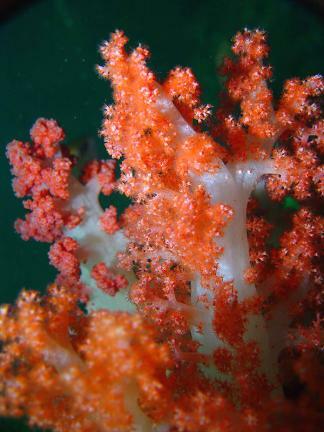 Many various types of coral live with the soft coral group, including stony corals, black corals, and sea fans. 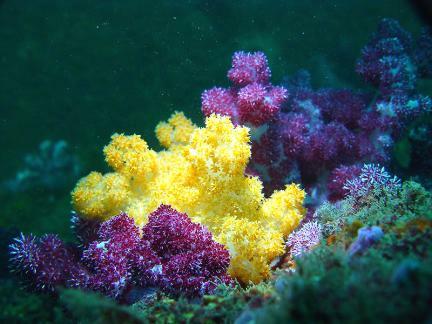 In the Songaksan Mountain sea area on the Daejeong-eup side, the population of soft corals lives 3-18m deep, and a tourist submarine will most likely be operated in this area. 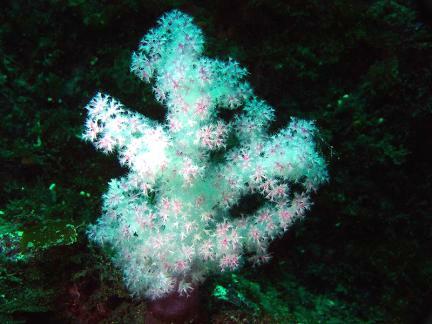 On the Songaksan Mountain side, soft coral forms beautiful flower beds. 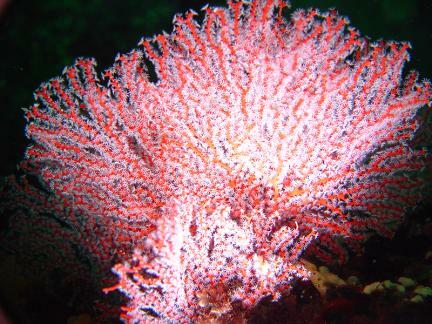 The five islands in the coastal area of Seogwipo (Beomseom Island, Munseom Island, Saeseom Island, Supseom Island, and Jigwido) Island form a natural breakwater where soft coral and anthozoa form colorful groups on the rock bed. 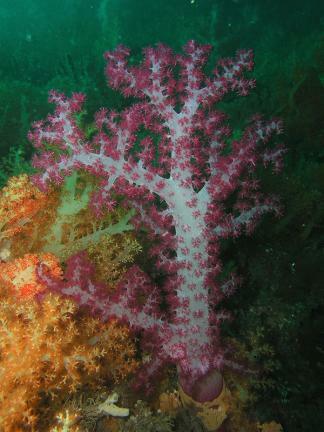 The waters of Jeju are the habitat of some 92 of the 132 species of Korean anthozoa, and 66 of these can only be found in Jeju, living in groups on rock beds at depth of 10-30m. 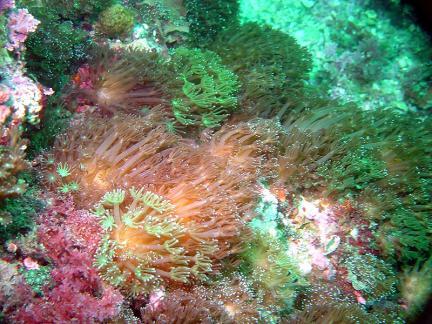 The Songaksan Mountain and Seogwipo waters are rare soft coral habitats that show coral groups in their natural state; thus, they are important places in studying the distribution of soft coral. 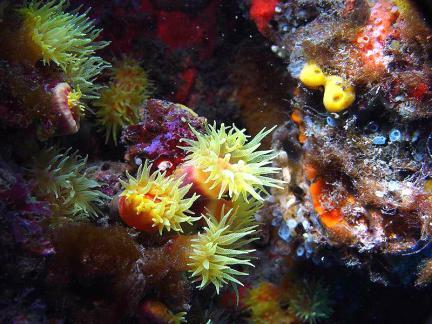 At present, the Seogwipo sea area (70,410,688 square meters) and the Songaksan Mountain area (22,229,461 square meters) have been designated as Natural Monuments.